My hands-down #1 travel tip for Italy is to book your hotels before you book your flights. Over the years it has gotten so popular that it can often be a challenge to find accommodations if you book too late. Location can make a huge difference in some of the smaller towns so be sure to do your research. There are 5 small towns that make up the landscape of Cinque Terre - Riomaggiore, Manarola, Corniglia, Vernazza, and Monterosso al Mare. Each one is unique and boasts advantages to your stay. As one of the most popular spots in Italy, it pays to be an early riser when in Cinque Terre. Tour buses and crowds tend to descent on each town from about 11-4. We made it a point to wake up early and tour a few villages before parking it by the ocean for an afternoon escape from the crowds. If you're thinking about hiking between the towns - come prepared!! The hikes are no joke and hiking between each town takes about 3-4 hours and is really intense. If you can’t find housing in Cinque Terre or you simple want to stay in a less crowed town, opt for Levanto. Levanto is the honorary “6th Terre,” and actually ended up being our favorite spot! Levanto is also great for larger groups traveling together. If you’re going in high season or you simply want a more authentic stay, Levanto is a treat in local culture! Home to the best ricotta I've ever had - I literally cried as I ate it - its small markets and local restaurants won't disappoint when it comes to the food scene. Plane: The main airports around Cinque Terre are Genoa and Pisa. If traveling internationally, you could fly into Rome or London and then take a hopper flight to either of these. Train: From the airport, hail a cab (In Italy, Uber only operates in Milan, but you can download MyTaxi ahead of time and its similar to using uber) and head to the train station. From Genoa to Levanto (which was our final stop) it took us about 1 hour, depending on which train you book it usually takes 1 to 1.5 hours. From Pisa, there is a local train that will drop you off in Monterosso (the 5th Terre), it takes about 1.5 Hours - tickets for either route can be found for just under 10 EURO. Book through Trenitalia for the most up to date times and routes! Car: Like most small villages in Italy, I wouldn’t drive here unless you hire a car service. You’ll quickly learn that having a car is actually more trouble than it’s worth especially if you aren't adventuring outside of the main towns. If renting a car - either pre-download Google maps for the area or consider opting for the GPS unit from the car rental - cell service isn’t always available. Despite what you’ve heard, you can drive in and around Cinque Terre. However, if you’re planning on visiting the villages you’ll need to park your car at the entrance to each town and walk in. If you are pressed for time, the trains are much quicker. Each of the 5 Terre’s are connected by a train that literally takes about 1-2 minutes between each town and are about 4 EURO each ride. You can get a day or week pass if you’re staying longer, it is more economical and makes it easier to explore each town multiple times. Simply stop by the train station in town to grab your pass! Riomaggiore - The 1st Terre, Riomaggiore is the most southern of the villages. I would head here early in the morning to take a peek around. 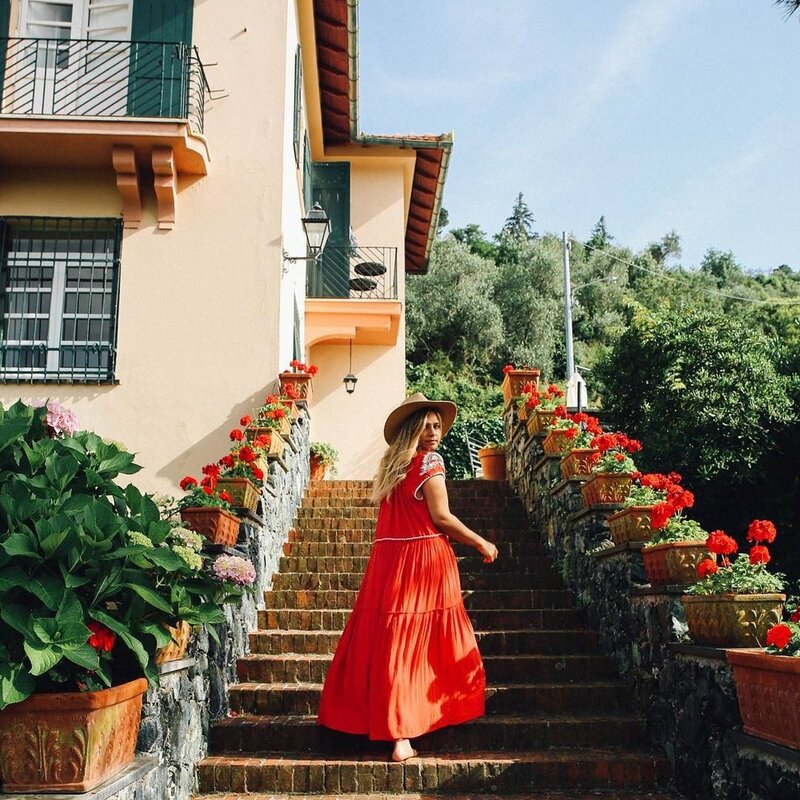 Get lost in their winding staircases, get a birds eye view of the farmers in their vertical gardens, walk through the mosaic tunnel, take a few snaps and then head to Manarola for a light colazione (breakfast). Manarola - With a small harbor and a great place to jump off into the ocean, Manarola’s pastel painted facades are great for taking a few snaps, grabbing an espresso and then head to the next town. Corniglia - Go here for lunch/appertivo/gelato! One of the lesser visited towns in Cinque Terre, is it the only village of the 5 that doesn’t have water access. Set atop a cliff, the ocean views do not disappoint. As the "mountain top" town it is much less crowded than the rest. When you get off the train you can either wait for the bus/shuttle to take you to the top or simply walk down the road next to the ocean and there will be a winding staircase to take you to the top. There is a little restaurant at the top of the town (slightly on the left) with an outdoor terrace that overlooks the ocean. Go there and try their local wine tasting and fritto misto! Then venture into the town and grab a gelato from a local gellateria. - One scoop basil, one scoop honey. Liguria is known as the birthplace of pesto, so trying to sweet version was an obvious MUST, and it did NOT dissapoint. The honey however, was something out of this world. As I set upon someones stoop lapping up this delicious nectar I was transported - the smell, the taste, I felt as though I was sitting in the hills with all of the notes the honey gelato carried with it - it will literally change your life, especially after wine tasting ;). Don’t forget to pack your swimsuit (like I did) when you go to Vernazza. This is a welcomed reprieve for anyone who likes to cliff jump or even for those who simply want a dip into the pristine waters. You’ll see everyone from daredevils to toddlers enjoying the marina, and so should you. The only “beach front” town, this is where you’ve probably seen those iconic Gray Malin photos of umbrella’s by the beach. With beachfront cafe’s you can take your pick of places to stop and enjoy a spritz. If you’re planning in sun bathing, I highly suggest purchasing a chair + umbrella. It makes any beach time that much more relaxing. If you see fresh anchovies on the menu, get them. Often marinated in lemon, they are so different than what you’ve probably had in the states. Shoulder season is beautiful in the Liguria region as sunny days are cooled by chilled nights. The weather is of constant change in the north so it is important to always pack warmer options and take a sweater with you. When we were there in June it actually rained a few times, but this didn’t keep us from going to the beach and enjoying our Aperols! It can get down to the 40s and 50s during winter, stay around the 60s and low 70’s during Spring and Fall and reach temps in the mid 80s in July and August. When traveling in Italy I always like to pack pant options for evenings - either for the weather or for the mosquitos. The mosquito’s are manageable, I usually pack citronella bracelets and a few Off Deet wipes just in case. No matter the season, you should always take a swim suit with you because you never know what the weather will be. Comfy shoes to walk around are a must, especially if you are going to be doing any of the hikes. Most restaurants we visited were very humble, so you don’t need anything too fancy for dinner - unless you’re deciding to head to Portofino! Santo Spirito is a cool hip area of town for a millennial crowd. This section of town is close to everything and offers great options for restaurants - home to two of my favorites! - and nightlife. Santa Croce is another great little neighborhood on the other side of the river and is slightly closer to the train station and Mercado Central. The city itself is not that large so you can’t go wrong anywhere in between these spots! Fly: While there is an airport in Florence, travel in and out of Florence can be higher than most other airports. Consider flying into Rome or Milan and taking a short train ride if the flights are out of your budget. Train: Trains from Milan are only about 1:45, Rome: 1 hour on the fast train and to/from Cinque Terre it is about a 2 hour journey with one stop/change at Pisa. Il Vico Del Carmine - Also in the Santo Spirito, this spot is great for dinner and good for groups. Owned by two brothers, they have amazing steak, pasta and wine selections and you must get the Panna Cota for dessert. Made by one of the brothers, if was the best I have had in all of Italy. *Order Brunello wine whenever you see it on the menu. Even if it is cooler on the coast, Florence will be nice and toasty! With average temperatures year-round, Florence is always a great idea! Expect 50s and 60s from late fall through late spring and 70s and high 80s summer and early fall. I recommend bringing a great pair of walking shoes - Birkenstocks are my usual sandal of choice. There are many cobble streets and warm afternoons that will take a toll on your feet. Be sure to bring shorts, layers and a hat to protect yourself from the summer sun. Layers are key, and the occasional summer shower occurs, so be prepared! Mercado Central - 2 story market full of fresh fruits, veggies, pastries, cured meats, fish etc. - You may be hungry and lured to try a local eatery around this area, but I highly suggest waiting for the market. Grab a Porchetta sandwich and some dried apricots. San Miniato - The most beautiful church in Florence, it is a Greco Roman church and the sun sets through the marble in the crypt. Santa Maria Novella - church really close to the train station - and is home to the Holy Trinity(1st 3D art piece in history) It is where Michelangelo was trained as an apprentice and is home to his first paintings and also where Massati painted his murals. Palazzo Contino - if you book, you'll either talk to Gaia who owns the home or her daughter Illaria - they're both as sweet as can be and very knowledgeable about the area. They will let you know ahead of time but Civita is a quiet place, there is 1 working restaurant and 1 cafe/bar. The adjacent town, Bagnoregio, has markets etc. I would suggest stopping along the way to bring groceries so you can enjoy the town and some peace and quiet. If you’ll be seeing the touristic sites, I would stay near Termini - the main train station in Rome. If you are looking for a neighborhood off the beaten path with local and vintage charm, opt for Trastevere - one of the oldest neighborhoods in Rome and also the cutest little area to walk around and have traditional food.. If you want to venture outside of Rome, renting a car is the easiest way unless you hire a driver. Depending on where you are staying, renting a car from Termini (the main train station) will probably be easier than trekking out to the airport again. If you are visiting Rome and Civita Di Bagnoregio is too far for you, I suggest visiting Lago Bracciano and its surrounding cities (Bracciano, Trevignano and Anguillara). Lago Bracciano is one of the most pristine lakes in all of Italy and is the number one supplier of drinking water to the city of Rome. A stunning lake that only allows wind powered boats to roam its tranquil waters, it is surrounded by the most quaint little towns that are only about a 30-35 minute drive from Rome. Tuscany can get pricy because of the wine scene but Civita Di Bagnoregio was quiet in mornings/evenings, fairly reasonable and centrally located, so it was the perfect stopping place between Florence and Rome. We didn’t have time to do tastings but if you are going to do this, I would plan it ahead. There are also local goat farms that have cheese tastings and tours if you’re looking for something other than wine! Aside from the usual suspects: the Colleseum, Vatican, Spanish Steps, Trevi Fountain, St. Peters Basilica and the Catacombs there are beautiful towns and destinations to visit just outside of the city centre. If you’re looking for something outside of Rome, consider visiting Lago Bracciano and Calcata. Calcata is another “ghost town” similar to Civita Di Bagnoregio that is easily a day trip from Rome. I don’t think there has ever been a time of year where I have visited Central Italy and it hasn’t rained. That being said, it can actually be quite refreshing depending on the time of year! Tuscany is one of the most lush climates I have visited in Europe. Wonder why its so green? It rains about 200 days out of the year. During summer, you can expect showers but rest assured, you wont freeze. Rome is also known for their random rain showers. If you don’t want to pack an umbrella, local merchants are sure to circulate them whenever it really starts coming down. From mid June to September you will experience traditional summer weather in the 80s, October is generally pleasant in the 70s while the rest of the year has temperatures that bounce between 50s and 60s. If you are visiting during the winter months a rain jacket is key to keep you dry when you’re seeing the sights! Other than that, a great pair of walking shoes and layers that you can add on and take off based on sun exposure and temps are key! I always stay in Positano because I adore the people and the central location to the rest of the coast. I LOVE this place. It is run by a mother and her two daughters. I have stayed here three times now. It is a humble spot that is affordable and has the most stunning views. It is located high enough in the hill that you can see the coastline, but not too high that you’re going up and down a million stairs every time you want a cornetto and espresso! (She can also accommodate 3 in one room usually). This was another great option in Positano. Although a little higher up the hill, it was not too bad of a walk. The room as gorgeous and this place, although a little more expensive, brought you breakfast in your room (on your own private balcony) and took care of us a little more. Offering suggestions for day trips, places to eat and which beaches are best. My advice is to get a backpack, the town is completely made up of stairs so being easily mobile (and not over-packing) really makes a difference. This is the backpack I usually use (Sarah got the same one as well) - although opt for the smaller size! Flight: You can either fly into Rome or Naples (Napoli). Train: Napoli is a 1-hour train ride from Rome on the Freccia trains. Amalfi Coast is about a 1/1.5 hour drive from Napoli. The only thing I would do here is to stop at Da Michelle for a pizza. Check online before to make sure they're open. * I have never had a problem but you should always be careful walking around Naples and keep an eye on your possessions. If heading to Positano first, my advice is to hire a car from Napoli to Positano. They are a father and son who are just too sweet! Francesco is the father and Vincenzo his son. I always recommend them because they are locals who really know the area, have beautiful, clean and comfortable cars and are always accommodating to travel needs. They also do tours (both on land and soon see) and have tons of recommendations for your stay! The great thing about taking a car is that they meet you in the train station and walk you to the car, because the train station/walking around that area can be a bit overwhelming. They will stop along the way - and believe me, you want to stop - getting to Positano is half of the beauty and experience of the area. I usually take the car from Naples to Positano, go to Capri for a night or two and then take the Ferry from Capri to Naples (instead of hiring the car round trip). Capri is a much more “bougie” island, but well worth the visit. If you have the time, take the local buses to Ana Capri to Faro Beach. It is a local beach spot with great little beach hut restaurants that have live music during summer as the sun sets. You can also do the chair lift in Anacapri to the top, amazing views! Hit the beach: There are many beach spots and beach clubs along the coast. You’ll want to call ahead and make a reservation if you can. Da Adolfo and Arienzo are beach clubs in Positano that you can take (free) boats to from the main dock - you’ll see small boats with their signs that you can catch about every half an hour at the docks. There is also another small beach “La Marinella” that you can access by a winding path at the bottom of the town. Grab a sandwich, a Pellegrino and some fresh fruit/veggies and head over here. As you look out at the marina you’ll see a small staircase/walkway that hugs the mountain (not where the boat docks are). If you follow this path (about 5-10 mins) you’ll come to a more “remote” beach - a very small one where an old grumpy man will set up a chair + umbrella (2 for 20 Euros) for the entire day. (Go earlier, it is a better chance of getting a chair at the small beach) If not there is a larger beach/beach club through the tunnel. There is also a little Italian deli on the stairs below the church in the town square. (I forget the name, but you can’t miss it!) This is a great place to get water, snacks (fruit and tomatoes) and sandwiches for the beach!! Most people recommend to go to Chez Black (which is famous, but not really breathtaking). At Tres Sorrelles, the squash blossoms and fritto misto are amazing (it’s one of their signature dishes). Basically everything there was great! It is right on the beachfront, and you can walk in a day or two ahead and make a reso or try and just walk in. La Tagliata (in Montepertuso) - You have to call or email ahead to make a reservation and they pick you up and take you up there - a lot of food but a great experience. You really feel as though you are part of the family when you have dinner here and it is such a great group experience, I wouldn’t skip! Also, if you love fish, tell them ahead of time that you don’t eat meat. Buca Di Bacco (Not the main restaurant) the shop is on a side street just up from the main square) - hands down BEST gelato. Activities: we rented Scooters from Pepe Positano and that was one of our hands down favorite experiences. If you aren’t comfortable on a scooter, don’t start on now - take a tour with Sorrentravel instead. Capri is made up of two areas, Capri and Ana Capri. When you land on the Island, you will be at Marina Grande where you can take a funicular (or a odd looking convertable) up to the top. Here you will find high end shops, hotels, and eateries. Whether you go for a day trip or end up staying, if you go to Capri, I would DEFINITELY get a boat tour around the Island. Contact Luigi, he took us all around - +39 3334128147, he is also the bouncer at Taverna (the most popular club on the island) and can get you in. I also have a friend - Carmine - that works at Limoncello Di Capri (The lemonade shop right when you get off the ferry into the island). Stop by there and ask for him. He can always hook you up with a boat if Luigi is booked. This is always one of my favorite parts of the entire trip. If only going for the day, take the funicular up to the top of town and go shopping. They have famous Capri sandals — (the place is next to Fiore) shop. [If you take the first right at the road at the top of the hill - it is here). *Salumeria D’Aldo - home of the best sandwich I have ever eaten. Whatever you do, make sure they put tomato and olive oil on it. Located in Marina Grande, very near to the bottom of the Funicular. Verginiello - excellent seafood, if you can make a reso before it makes it easier but you can also just walk in. Ristorante Buca Di Bacci (different than Positano) - great pasta/pizza and local vibe. Buonocore Gelateria - they make fresh waffle cones while you wait, must have! Always be prepared when heading to the coast. While the seasons are normally steady, we did get caught in a rain storm last June - it was quite magnificent too. Always bring a hat to shade yourself from the sun and long layers to guard yourself from the mosquitos at night time. You’ll want to pack plenty of bikini’s AND coverups. Aside from the beach, you wont see the locals walking around in their bikini’s, they are always covered up in the cutest fashion. SOUTHERN ITALY - SICILY- COMING SOON! We’ll be traveling there later this summer (September 2019), so please follow along on social media to see all our snaps and secrets!